Traffolyte is used extensively for engraved plastic valve tags or any application where environmental conditions demand both long term durability and clarity. Unaffected by water and damp conditions, traffolyte also has a wide choice of bright colours that resist fading. Nylon coated stainless steel wire – in conjunction with aluminium ferrules, strong and durable, recommended for secure, permanent fixings to curved surfaces and environments where vibration and movement is possible – interior or exterior use. Available in 1mm or 1.5mm thicknesses. Nickel plated brass chain, easy to fix and adjust, used extensively in plumbing applications for fixing tags to pipework. Not recommended for exterior use or corrosive environments. 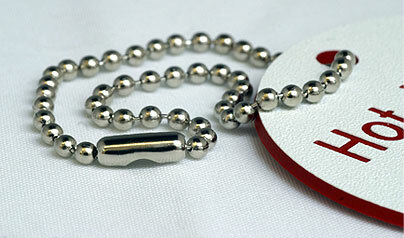 This chain is available in 16cm pre-cut lengths or supplied on a spool. 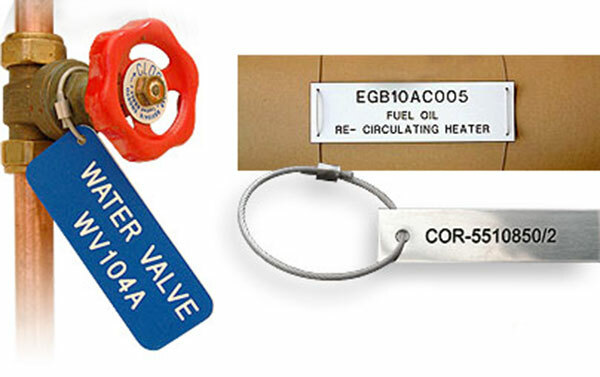 Our Traffolyte valve tags are used in locations across the world where clear and durable labelling and identification is required in industrial and external environments. Traffolyte labels and tags are ideal for safety signs, warning signs, control panels for switchgear, thanks to its zero conductivity, high environmental tolerance, wide choice of colours and high durability. Engraved labelling is the best solution for this application, because the unique environmental conditions demand both long term durability and clarity. Unaffected by water and damp conditions, with bright colours that resist fading even in strong sun and salt air. Clarity and durability are key factors for safety in this industry, so engraved traffolyte labels are an ideal choice for long term fade and wear resistant labelling and signage solutions. The bold colours and long-term durability of traffolyte labels are ideal in this safety-critical environment. Fire resistant materials can be supplied for use in underground or tunnel environments. Simply call the TCE office on 01782 643278 or use our enquiry form.